It seems that getting frozen in carbonite can be one of the most excruciating experiences one could go through when one is the prisoner of the Hutts, Jabba especially. Still, the iconic scene of Han Solo being trapped in carbonite has been translated into the real world through the rather surreal $19.99 Star Wars Han Solo in Carbonite Cutting Board. 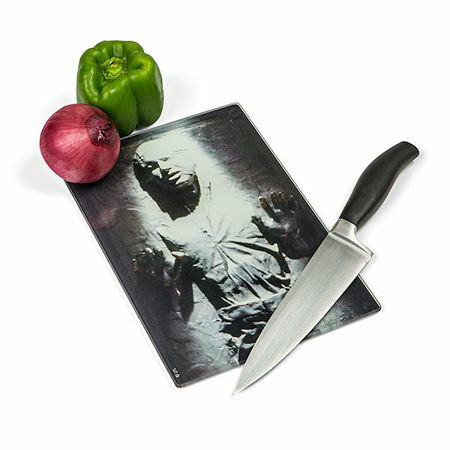 As its name suggests, this is one cutting board that boasts of an image of Han Solo frozen in carbonite, but in reality, it is made out of a hygienic glass surface that is both odor and stain-resistant, while sporting rubber non-slip feet on the back so that all of your digits are well protected in the kitchen.